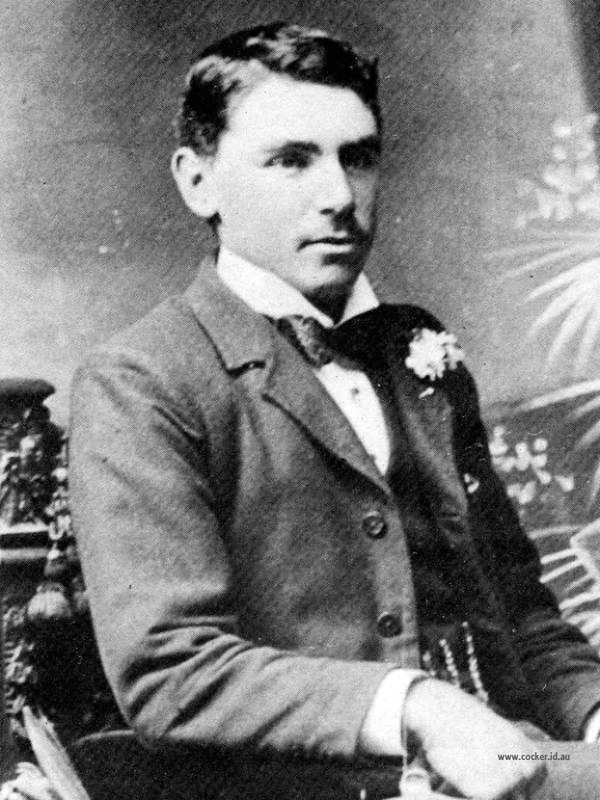 3-Percy Samuel Walker was born on 30 Jul 1883 in Spring Rises, Exton, died on 23 Nov 1974 in Spring Rises, Exton at age 91, and was buried on 25 Nov 1974 in Westbury, Tasmania. Percy married Margaret Louisa Rootes, daughter of Thomas Richard Rootes and Mary Ann Warburton, on 27 Sep 1911 in Launceston. Margaret was born on 18 Dec 1887 in Westbury, Tasmania, died on 1 Aug 1964 in Westbury, Tasmania at age 76, and was buried on 3 Aug 1964 in Westbury, Tasmania. Percy was away from Spring Rises for approximately 15 years, farming at Weegena and Beresford, Exton. He returned to Spring Rises on the death of his father and remained there until his death in 1974. The farm had been sold to the late Geoff Wadley just prior to his death.Percy was a member of the Westbury Agricultural Show Society, and an exhibitor of livestock for a number of years. He received a long service medal and bar from the Westbury branch of the Red Cross. He had connections with the Exton Methodist Church for most of his life, being a church steward and attending church regularly until 90 years of age. He was a loyal supporter of the church, following in the footsteps of his father Thomas, and grandfather Michael. Throughout his life, Percy was very interested in sport. He was captain of the Exton Seconds team and was batting with C. L. (Jack) Badcock (later a test cricketer), when Badcock made his first century. He wrote a booklet, History of Cricket in the Westmoreland Association with a foreword by the late Bob Ingamells, O.B.E., President of the N.T.C.A. Early memories are of sitting up and listening to the test cricket matches in England with him. He retained his great interest in sport to the last. His sons excelled at cricket and he made a cement pitch for them, spending hours bowling during the dinner hour and after evening milking. Vera French relates that as a young lad playing for Selbourne against Exton he was bowled first ball by Percy. As he returned disconsolately to the pavilion, he was told that he would have to bat again in place of his father who had gone home to milk. Percy again bowled him first ball. Nevertheless, they remained on very friendly terms. Percy was keen on his vegetable garden and worked in it almost to the last. He was also a very good draughts player, having won a silver medal for playing. The difficulty in later years was in finding players of his calibre, his last good rivals being Mr. Teddy Bellinger and Mr. Williams, father-in-law of the Reverend T. Griffiths, Chalmers Manse. It is said that when a certain gentleman went courting one of his daughters, he used to ask him to play draughts. Early memories of some of Percy's children are of playing in all the interesting outbuildings on the farm, almost the size of a small village. Old and new stables, blacksmith's shop, butcher's shop, dairy, and machinery sheds, etc. Other memories are of walking through the bush to the Meander River on the back boundary. Tramps called at "Spring Rises" fairly frequently during the depression years. An old man, Mr. Archer (called Troll by the children) lived for many years in a fallen tree trunk with a lean-to added, near the river boundary. He usually spent the winter on the N.W. coast and after opening gates he would say that he would walk up the aisle. Unfortunately his tree was burnt down in a bush fire. Percy had a family of two sons and five daughters. The eldest son, Allan Thomas, married Blanche Gray. The second son, Roy William, married Iris Bellinger. He died in 1980 aged 65 years. The eldest of the family, Alice, married Ray nor Young. The following two daughters, Vera and Gladys, did not marry. Doris married Percy Bellinger and Laura, the youngest of the family, married Max Blundell. Percy was of a cheerful disposition and had many friends. He suffered with bronchitis the latter part of his life, but it did not restrict his activities. He died at "Spring Rises" at the age of 91 years, having attended the Westbury Show a fortnight previously. 4-Alice Mary Walker was born on 3 Dec 1911 in St. John Street, Launceston, was christened on 2 Jun 1912 in Launceston, died on 7 Jan 2002 in Somerset at age 90, and was buried on 10 Jan 2002 in Deloraine Cemetery. Alice married Raynor Kitchener Young, son of George Robert Young and Hilda Mabel Harris, on 8 Apr 1934 in Westbury, Tasmania. Raynor was born on 6 Feb 1910 in Spring Banks, Longford, died on 15 Mar 1984 in Deloraine, Tasmania at age 74, and was buried in Mar 1984 in Deloraine Cemetery. They had four children: Lindsay Raynor, Barry Thomas, Elaine Ruth and Robert Alan. 5-Barry Thomas Young was born on 17 Oct 1935, died on 7 Aug 2002 in Burnie, Tasmania at age 66, and was buried on 9 Aug 2002 in Burnie, Tasmania. Barry married Patricia Faye Moyle. Patricia was born on 19 Oct 1937. They had four children: Fiona Anne, Matthew Raynor, Verity Jane and David Barrie. 4-Allan Thomas Walker was born on 1 Jan 1913 in Strathroy, died on 18 May 1997 in Deloraine, Tasmania at age 84, and was buried on 19 May 1997 in Westbury, Tasmania. Allan married Blanche Gray on 7 May 1947 in Hagley, Tasmania. Blanche was born on 18 Jun 1921 and died before 2001. They had three children: Allan James, Michael Thomas and Peter David. 5-Allan James Walker was born on 25 Nov 1949. Another name for Allan is Allan Thomas. Allan married Suzanne Broomby. Suzanne was born on 8 Oct 1957. They had four children: Christopher Alan, Nicholas David, Timothy James and Scott. 6-Christopher Alan Walker was born on 18 Jun 1983. 6-Nicholas David Walker was born on 19 Feb 1985. 6-Timothy James Walker was born on 27 Dec 1986. 5-Michael Thomas Walker was born on 22 Aug 1954. Michael married Joanne Nash. Joanne was born on 23 Jun 1963. They had two children: Wayne Michael and Michelle Anne. 6-Wayne Michael Walker was born on 26 Aug 1983. 6-Michelle Anne Walker was born on 27 Feb 1987. Michelle married someone. She had one daughter: Taylor May. 5-Peter David Walker was born on 20 Nov 1958. 4-Roy William Walker was born on 20 Mar 1915 in Dunorlan, Tasmania, died on 4 Aug 1980 in Westbury, Tasmania at age 65, and was buried in Aug 1980 in Westbury Cemetery. He served in the Second World War. Roy married Iris Myrtle Bellinger, daughter of John Henry Bellinger and Ivy Ellen Creedon. Iris was born on 21 Mar 1918 in Westbury, Tasmania, died on 8 May 1991 in Launceston at age 73, and was buried in May 1991 in General Cemetery, Westbury, Tasmania. They had two children: Kay Patricia and John Percy. 5-Kay Patricia Walker was born on 12 Oct 1945. Kay married Danny Gerald Donovan. Danny was born on 16 Sep 1943. They had two children: Christopher John and Nicholas Gerald. 6-Christopher John Donovan was born on 21 Feb 1968. 6-Nicholas Gerald Donovan was born on 23 Jun 1970, died on 16 Dec 1993 in Westbury, Tasmania at age 23, and was buried in Dec 1993 in St. Marks Church of England, Deloraine. 5-John Percy Walker was born on 3 Sep 1952. John married Pauline Ellis. Pauline was born on 17 Sep 1951. They had one daughter: Sarah Anita. 6-Sarah Anita Walker was born on 18 Nov 1982. Sarah married Scott Merritt. Scott was born on 5 Sep 1982. 4-Vera Maggie Walker was born on 9 May 1918. 4-Gladys Annie Walker was born on 12 Jan 1920. 4-Doris Rebecca Walker was born on 9 Jul 1921 in Launceston, died on 4 Nov 1994 in Launceston at age 73, and was buried on 8 Nov 1994 in Westbury, Tasmania. Doris married Percy John Bellinger, son of Edney Thomas Bellinger and Florence Ivy Gillam, on 30 May 1942 in Westbury, Tasmania. Percy was born on 17 Jun 1918 in Westbury, Tasmania and died on 21 Aug 2009 in St. Lukes Hospital, Launceston at age 91. They had three children: Wendy Faye, Jillian Anne and Craig Percy. 5-Wendy Faye Bellinger was born on 13 Nov 1946. Wendy married Kevin Cruickshank. Kevin was born on 18 Oct 1943. Wendy next married Robert Cluey. Robert was born on 3 Jul 1951. 5-Jillian Anne Bellinger was born on 28 May 1951. Jillian married Rex Williams. Rex was born on 10 Jun 1949. Another name for Rex is Roger. They had one son: Rohan Jervis. 6-Rohan Jervis Williams was born on 22 Aug 1987. Jillian next married someone. He had one son: Rohan Jervis. 6-Rohan Jervis Williams was born on 22 Aug 1987. 5-Craig Percy Bellinger was born on 22 Mar 1955. Craig married Suzanne Greenwood. Suzanne was born on 30 May 1952. They had two children: Sarah Elspeth and James Thomas. 6-Sarah Elspeth Bellinger was born on 31 Oct 1980. 6-James Thomas Bellinger was born on 8 May 1983. 4-Laura May Walker was born on 8 Sep 1923. Laura married William Maxwell Blundell. William was born on 8 Feb 1919 in Queen Victoria Maternity Hospital, Launceston, died on 12 Dec 1998 in Launceston at age 79, and was buried on 15 Dec 1998 in Launceston. They had four children: Robin Maxwell, Kerry David, Peter John and Ruth Margaret. 5-Robin Maxwell Blundell was born on 17 Dec 1946. Robin married Christine Edith Badcock. Christine was born on 23 Sep 1953. They had two children: Mark David and Kristy Elizabeth. 6-Mark David Blundell was born on 29 Jan 1979. 6-Kristy Elizabeth Blundell was born on 25 Nov 1984. 5-Kerry David Blundell was born on 20 Oct 1949. Kerry married Patricia Faye Cross. Patricia was born on 17 Jul 1955. They had two children: Paul Geoffrey and Jason Alan. 6-Paul Geoffrey Blundell was born on 23 Mar 1982. 6-Jason Alan Blundell was born on 2 Aug 1984. 5-Peter John Blundell was born on 25 May 1952. 5-Ruth Margaret Blundell was born on 24 May 1955. Ruth married Dale Geoffrey Anderson. Dale was born on 30 Jan 1952. They had two children: Susan Ruth and Megan Lauren. 6-Susan Ruth Anderson was born on 21 Feb 1978. 6-Megan Lauren Anderson was born on 28 Sep 1980.